FLOW-3D‘s ability to model large amplitude non-linear wave propagation over complex topography and coastal structures makes it the ideal tool to analyze the performance of breakwater structures under the hydrodynamic forcing of waves ranging from simple linear waves to random sea states. 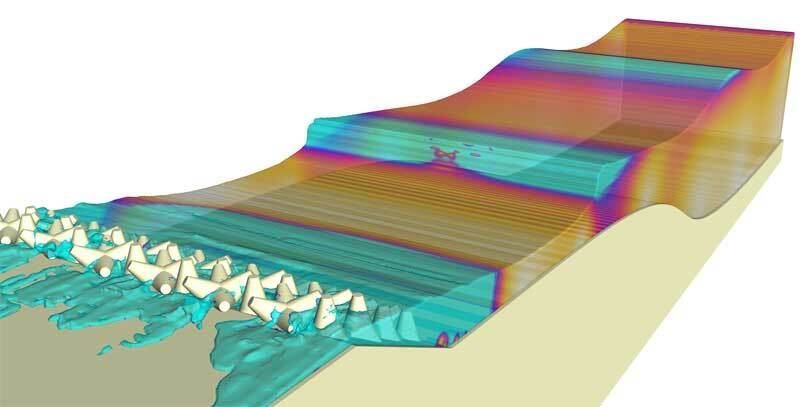 In addition to measuring the structure’s ability to remove kinetic energy from the incoming waves, FLOW-3D allows users to conduct detailed analyses of sediment transport and allows for an assessment of the forces acting on the breakwater elements. In the even more important context of integrating coastal structures with ecological imperatives, FLOW-3D allows engineers to assess the detail of flow patterns in and around the structures. Rubble-mound breakwaters are often used to protect coastlines from the effects of extreme wave loading and to prevent longshore drift. Using FLOW-3D, engineers can estimate turbulent energy dissipation in armor layers, wave reflection coefficients as well as overtopping volumes associated with these structures.